Here’s a freebie for all my loyal readers: a free Photoshop action I created myself to eliminate repetitive tasks I (used to) go through each time I scanned in a new sketch for further work in Photoshop. 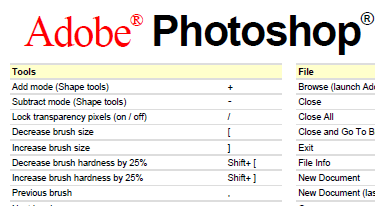 Boost your productivity with this free Photoshop download. 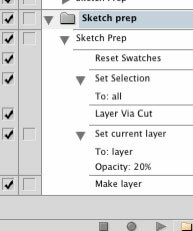 My custom Sketch Prep action — as you can see from the screenshot — simply resets your color swatches back to the default black/white, does a Select All on the background layer, cuts the image to a new layer (leaving you with a flat white background layer) and then bumps the opacity of the newly-created layer down to 20%. It then adds a fresh new blank layer for you to start drawing in.